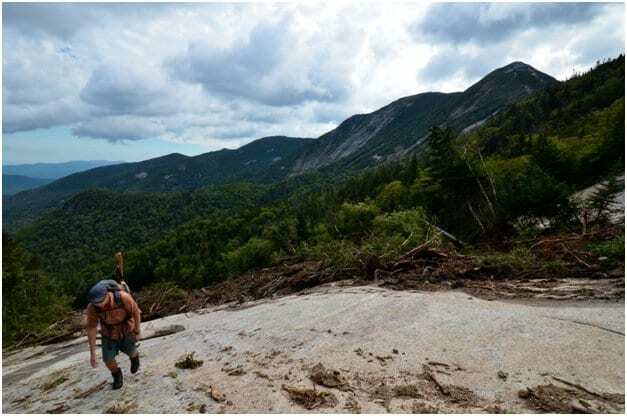 A hiker ascends the new slide on Saddleback Mountain. Photo by Brendan Wiltse. 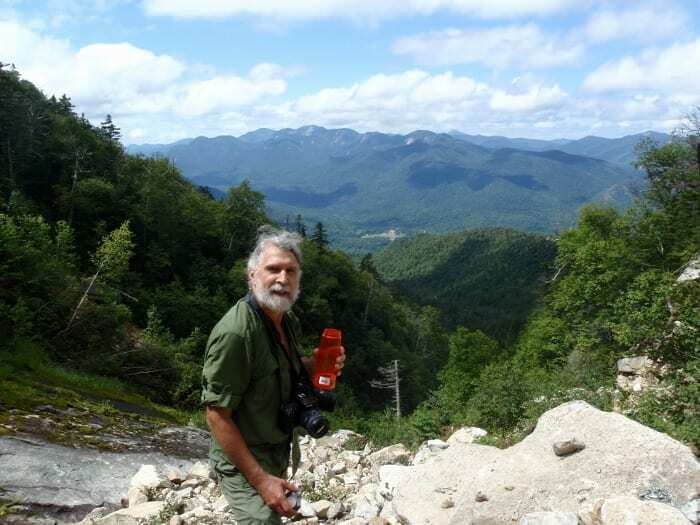 The new issue of the Explorer (November/December) will include a two-page spread on climbing five new slides created by Tropical Storm Irene in the High Peaks. 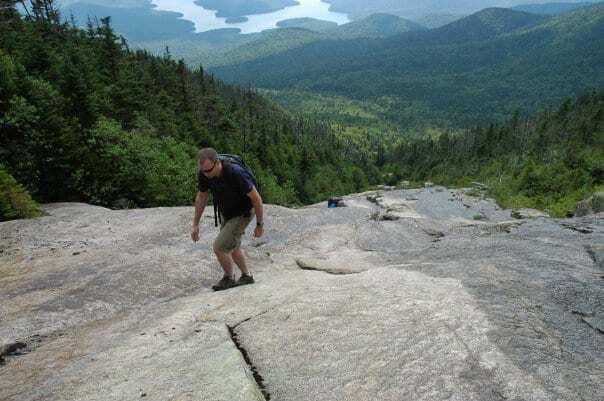 I’ve blogged about my climbs of four of them (see links below), but I have yet to write about my climb of the long slide on Saddleback Mountain. I climbed it two weekends ago with Ron Konowitz. It’s steep enough in places that I would recommend rock-climbing shoes or approach shoes. Aerial view of the new slide (on right). Photo by Phil Brown. You can easily reach the Saddleback slide via the Ore Bed Brook Trail in Johns Brook Valley. Starting from the suspension bridge near the ranger’s cabin, hike 1.7 miles to a house-size boulder on the right side of the trail (it’s 0.25 miles past a lean-to). From the boulder, you can see the slide on the right, a short bushwhack away. If you leave the trail here, you’ll be walking up a scoured section of Ore Bed Brook, a mix of slab, boulders, mud, and pools. In a half-mile, you’ll reach the wide slabs of the slide proper. Your other option is to stay on the trail past the giant boulder: in another 0.8 miles, the trail passes the edge of the slide. From the second access point, it’s just about a mile to the top of the slide. From the boulder, it’s 1.9 miles. The ascent is gradual at first, but it steepens considerably as you get higher. Toward the top, you need to climb over or around a rock wall. We went left, which was fine, but we encountered a muddy section just past the wall. While ascending, be sure to turn around occasionally to take in the spectacular view of the north face of Gothics. The climb ends with a dike, one to two feet wide, that runs down the middle of the slide. The pitch here is very steep, but the dike is stepped. At the end you’ll need to make a tricky move to gain the woods. From the top of the slide, you have a 10-minute bushwhack to Saddleback’s summit. We angled left and did not have too much trouble. Saddleback’s summit offers marvelous views of the High Peaks. Between the slide and the summit, you’ll be sated with scenery. If you return by the Ore Bed Brook Trail, you’ll cross another slide created by Irene. 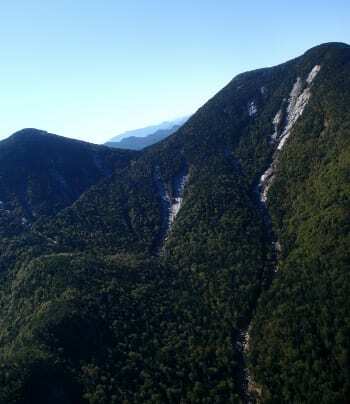 In the aerial photo, this two-pronged slide is to the left of the Saddleback slide. Hey. Very cool blog!! Guy .. Beautiful .. Superb .. I will bookmark your site and take the feeds also…I’m happy to locate so much useful info here in the article. Thanks for sharing..